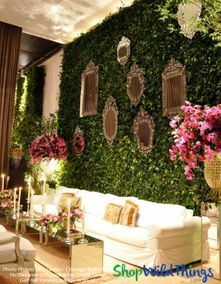 We love the easy way that our Greenery Backdrops connect to one another to cover large spaces! A few styles are Fire Rated, in case you're Decorating a venue that has a Fire Marshall requirement. 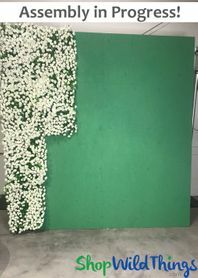 Four of our Green Foliage Backdrops are UV Rated for up to 5 years of continuous outdoor use (which is about what you'd get from the artificial turf that is installed in homes and public spaces) - making them perfect for "permanent" professional installations. The panels are beefy, but lightweight enough that they can be installed using something as simple as a nail gun! The grids on the back have tons of attach points, making hanging them a breeze. You can make Greenery Backdrops, cover simple plywood boxes to make bars, and more!